People, I thought to myself. Others prodded, who was she? I realized no one was laughing. Laden with flowers and cards. placing it gently on the backseat. A very touching and real poem Susan. Having preached literally thousands of funerals over the years, I must say that you have captured with great sensitivity the emotion and often surprises found at a funeral. I found myself standing in the minister’s place in your graphic as the family witnessed the surprise guest. 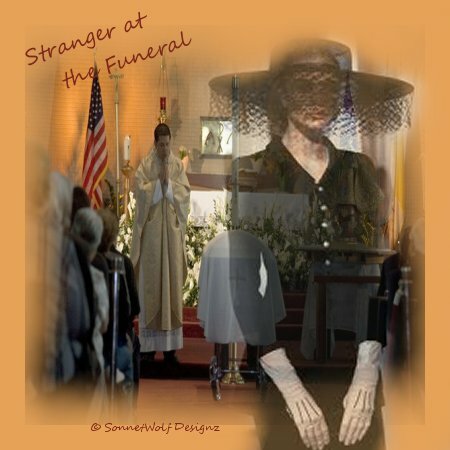 I have encountered such surprises in funerals many times at the unsettling experience of family and friends. A very excellent poem in capturing the reality of a subject few care to discuss but all will experience. A job well done. Thank you Dr. Lee. As you noticed, this is a Biographical Poem, meaning, of course, it’s true. To this day, we don’t know who she was. I hate to have to think that my father did have “another woman” as awful as that sounds. But she flew in like the wind, and left in a hurricane, not wanting to call any attention to herself or be met by anyone, especially “the daughter.” To this day it haunts me, and I feel sorry for my mother, who loved my father and sacrificed her entire life to be a wonderful, doting wife to him, gave him her best years, and everything she had. She’d already died of a broken heart after the death of my brother. I can’t jump to any conclusions, even when conclusions jump in ours. I’ve moved on with this. It is what it is. Stranger at the Funeral, at my father’s funeral.